ZOOMLION QY120V truck crane is a fine-performed and high-reliable product which combines our company many years’ manufacturing experience in mobile cranes with advanced international technologies for meeting the market demand. 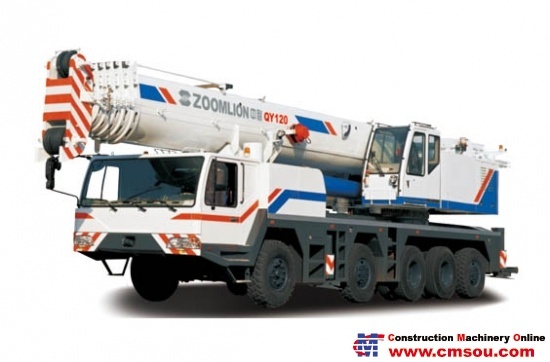 This high-tech product which perfectly integrates mechanical system, electrical system and hydraulic system into a whole and partly combines the technology of all terrain crane will provide you good control performance, excellent jogging performance, large lifting capacity and super lifting height, so it can be applied in many fields of national economic construction. This product can be widely used in chemical industry, mining establishments, oil field, harbor, building sites, and so on to do lifting and hoisting work. Do not use it in strong electromagnetic fields. This truck crane, with spacious cab and luxurious equipments, adopts full slewing systems, telescopic boom, electro-hydraulic proportional control system and self-made full-width special purpose chassis with 5 axles (3 driving axles and 3 steering axles). The latest electro-hydraulic operated directional control valve and series-connected gear pumps are all of load-feedback function. Open and close type variable system ensures the actuating mechanism to fulfill its working performance to the utmost. The control type of two levers, which are flexible and stepless speed regulated, can carry out any of the 2 crane movements “Spool up main / auxiliary winch”, “Reel off main / auxiliary winch”, “Telescope boom in / out”, “Derrick”, and “Slew” simultaneously. All that not only provides the crane with stable and reliable simultaneous movements but also greatly improves crane’s working efficiency. The safety devices fitted in hydraulic system, such as relief valve, balance valve, hydraulic lock and brake valve etc., prevents the oil line from overloading and the accidents caused by oil pipe breakage.